In episode 209 of The Stitch TV Show, Pam and Lynn talk about the new Pantone color of the year, “Greenery“, Pam’s design process for The Nope! Quilt hanging behind us (part of the fat quarter challenge we did this year), and what you need to know about sewing machine needles. The quilt hanging behind us is The Nope! Quilt, a fat-quarter friendly quilt! The pattern is available in our shop as a digital download. Our new mugs came from Lasting Impressions! Get your own mugs, tumblers, and other items custom laser engraved. Learn more on their website. 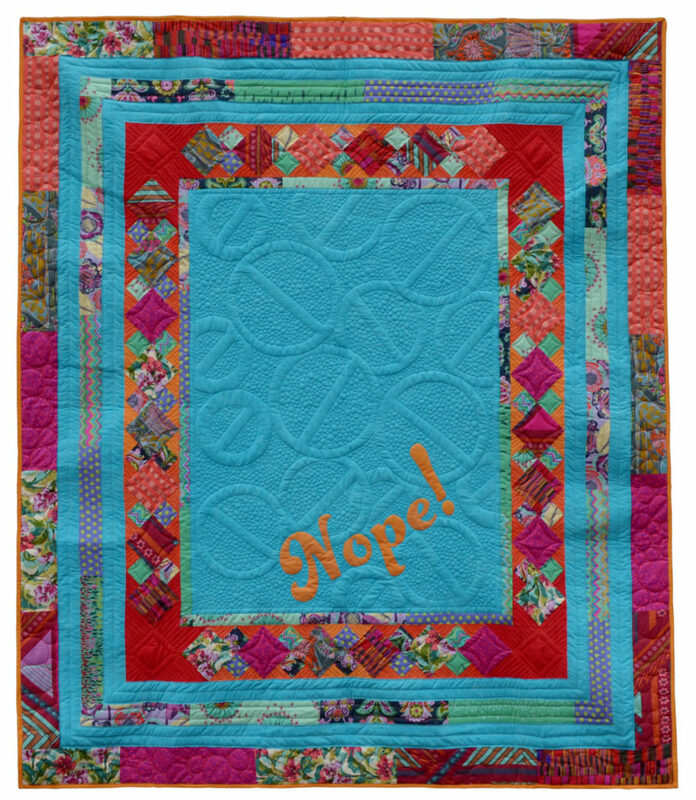 Here’s a short video on how Pam chain pieced the various borders for The Nope! Quilt. Thanks to our partners 77peaches enterprises and Big Think Productions! We could not do it without you. Thank you both for keeping me entertained during my recovery from knee surgery! I had a menisectomy and have been bingeing on The Stitch and Hip to Be a Square while I do my exercises from physical therapy. I was about two months behind, but as of today, I am caught up–at least until Pam posts the next podcast (later today, perhaps)! I’m itching to get back to stitching, thanks to listening to all you have been doing! Oh my goodness Lynn…I thought I was the only person who changes purses when mine gets too full of junk LOL….made me laugh…Love you guys!